Have you ever tried to record a podcast episode in a particularly noisy environment? Whether it’s on the floor of an industry event, or in the corner of a busy bar, it can be nigh-on impossible at times to pick out the actual conversation from the background walla. As a podcaster running an interview show, you won’t always be able to get guests into a studio environment. And whilst remote interviews are brilliant for accessibility, there’s no substitute for having a face-to-face conversation. Add in a bit of background ambience and it can really set the scene in the listener’s head, and put them right there with you. But there’s a tightrope thin line between ambient “in the moment” audio and inaudible noise. So as well as being mindful of where you’re recording and how it’s going to sound, you also need to think about what you’re recording with. Does your mic tend to reject most of that environmental sound? Or does it seem to go looking for it? Some mics perform better than others on this front, and it’s largely due to what’s called their “polar pattern.” Those are the different ways various models of mics “hear” sound. Here’s our full guide to mic polar patterns, if you’re interested to learn more on that. The bottom line is, that there’s no better way to hone in on one particular sound and reject everything else around it, than to use what’s known as a “shotgun mic”. 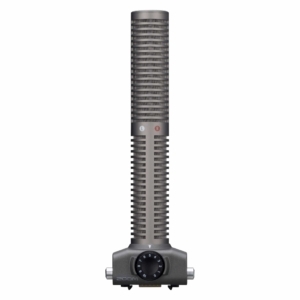 These are long pole-like mics with a laser-focused pickup. Traditionally however, these mics are majorly expensive, and well beyond the budget of your average podcaster. All isn’t lost though – especially if you’re the proud owner of a Zoom H5 or Zoom H6 digital recorder . . . The Zoom H5 or H6 are both incredibly powerful and versatile recorders right out of the box. But some folks own them for years without realising that the “built-in” mics on the top are actually capsules that can be removed and replaced. This further adds to the amount of recording options available to the user. 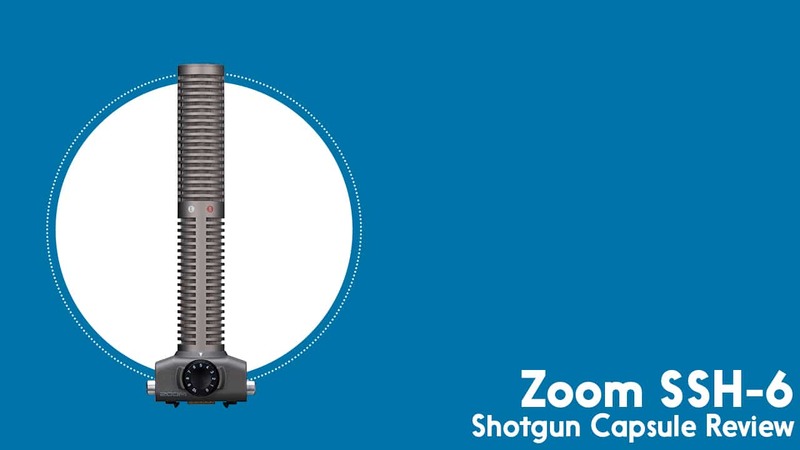 The Zoom SSH-6 is one such capsule, and we recently decided to buy one here at The Podcast Host to add to our field and location recording kit bag. How Does the Zoom SSH-6 Work? You can have the default stereo mic capsule unclipped and the SSH-6 attached to your recorder in a matter of seconds. After that, it follows the exact same recording principles as the original stereo capsule. There’s a gain dial on the front, and you just need to have the L/R inputs selected to start picking up a signal. The SSH-6 capsule differs from its otherwise identical brother, the Zoom SGH-6 because it also his bi-directional recording capabilities. 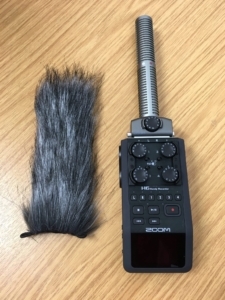 This means you can use the mic’s shotgun features to point directly at a presenter or interviewee, but you can also record a bit of the ambience of the environment with the mid-side recording option. You can easily adjust the input levels of this recording using your recorder’s ‘toggle’ button, or just leave it switched it off altogether. I mentioned the struggle of recording face-to-face conversations in busy environments already. But I should point out that the SSH-6 is really only designed to point at one source (ie; a voice) at one time. This means that if you’re using it for an on-location interview, you’ll need to make a decision on how best to utilise it. Here are some suggestions. Use two Zoom recorders and two shotgun capsules. This would be the most effective, but also the most expensive solution. Use the recorder as a handheld, pointing the mic back and forward, depending on who’s speaking. Place priority on capturing your guest’s audio, and plug in something like a Samson Q2U to pick up your own voice. These mics also have great noise rejection. Not half as much as any shotgun mic, but still better than most. Whatever setup you opt for, just be sure to monitor your recordings as they happen so you can pick up on any issues whilst you’re still in a position to fix them. Don’t wait til you get home and load the files onto your computer to find out that you can’t hear a single word. You can buy the Zoom SSH-6, brand new, on Amazon for $150, or on Amazon UK for £99. Remember, you need a Zoom H5 or Zoom H6 to actually use it though! Here’s two sound samples, back-to-back, recorded with the SSH-6 running into the Zoom H6. One was recorded in the office, and the other, outdoors in a rural location. No cleaning or post-processing has been applied to either. The Zoom SSH-6 is a brilliant microphone, and I genuinely can’t find any faults with it at all. Whether or not you should get one though, depends on a couple of things. Do you actually need one? If you pretty much just record into a USB mic doing solo episodes or Skype interviews, then probably not. Do you have a Zoom H5 or H6? And do you do a lot of on-location recording with it? If the answer to that second question is yes, then getting yourself a SSH-6 (or SGH-6) is worth serious consideration. It’s a great piece of kit to add to your on-the-go setup and beef up your digital recorder capabilities. On top of that, at $150/£99 it’s really good value – especially if you compare it to some other mic options in that price range! If you need some more tailored advice for your own setup, or want help with any other aspect of podcasting, then why not take a look at The Podcast Host Academy That’s our Premium Site, where you’ll find access to all of our video courses, tutorials, ebooks, and downloadable resources. On top of that, you’ll get access to our regular live Q&A sessions and community forum. It’s the ideal place to plan, launch, and grow your podcast in a focused, structured manner!